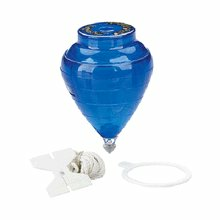 This Imperial Spin Top by Duncan is the ultimate Spin Top for tricks and fun! It features a lightweight plastic body ideal for either indoor or outdoor use, a no-mar plastic tip and includes string and button so that as soon as you open the package you can spin round round yeah right round! Colors subject to availability.